A Japanese high court on Tuesday accepted an appeal by Shikoku Electric Power Co. to restart a nuclear reactor in western Japan, saying worries over a volcanic eruption damaging the plant are "groundless." 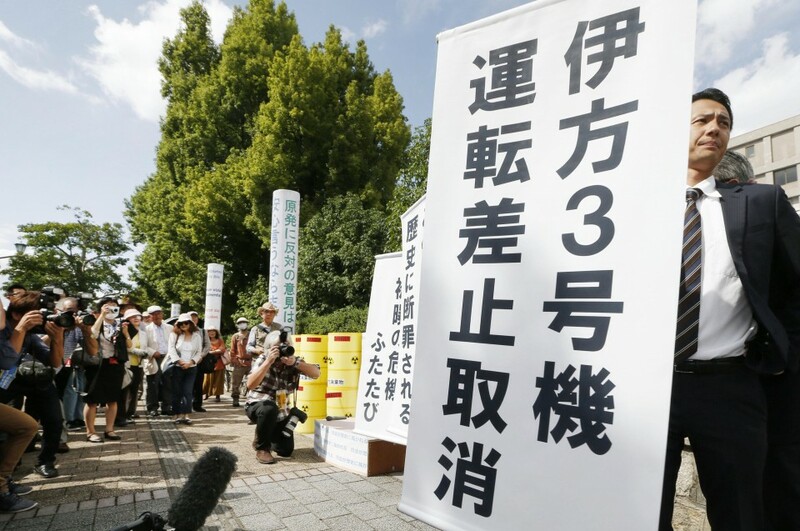 The decision by the Hiroshima High Court is an about-face from its earlier provisional injunction that demanded the power company halt the No. 3 unit at the Ikata power plant in Ehime Prefecture until the end of this month due to safety risks associated with potential volcanic activity. The temporary suspension order, issued in December last year following a request from a local opposition group, marked the first case in which a Japanese high court prohibited operations at a nuclear plant since the 2011 meltdowns at the Fukushima Daiichi complex. Presiding Judge Masayuki Miki said in the ruling, "The possibility of a destructive volcanic eruption during the plant's operating period is not backed by grounds and there is a small chance of volcanic ash and rocks reaching the plant," which is about 130 kilometers away. Following the court's decision, Shikoku Electric said it will reboot the No. 3 reactor on Oct. 27. The unit has been idle for maintenance since October last year. Plaintiffs expressed their intent not to file an appeal with the Supreme Court, which will finalize the decision by the high court. The Nuclear Regulation Authority, the country's nuclear watchdog, said, "Drawing on the lessons learned from the nuclear accident at the Fukushima Daiichi plant, we will continue to impose strict regulations based on scientific and technical knowledge." Separately, residents in nearby Oita, Kagawa and Yamaguchi prefectures have also been seeking to stop the reactor in pending court cases. The Oita District Court is scheduled to hand down a decision on Friday. In addition, a request to extend the period of the injunction beyond Sunday has been filed with the Hiroshima District Court. In the injunction, the high court had said the power company underestimated the risks of heated rocks and volcanic ash reaching the plant if a big eruption occurs at the caldera of Mt. Aso in Kumamoto Prefecture. The court decision was a major victory for Japan's antinuclear movement and dealt a blow to the central government and utilities which hope to bring more reactors back online. Shikoku Electric claimed in the appeal that it believes there is a "low possibility" of the volcano experiencing a large-scale eruption while the reactor is in operation. The company had also said there is no safety concern linked to the reactor, having taken measures to counter quakes based on a ground survey. Plaintiffs, however, argued that the resumption of operations at the plant is "unreasonable" because of a "high risk of an accident." After the decision, a group of residents and their supporters expressed their anger and frustration. "The decision is pandering to power and has contradictory points," said Hiroyuki Kawai, a lawyer for the plaintiffs. He encouraged them to keep on fighting, saying, "We once stopped the Ikata power plant. Delays in restarting nuclear plants across the country are (the fruit of) our battle." Kenta Tsunasaki, a plaintiff living in Hiroshima whose grandmother experienced the atomic bomb in 1945, said that while he had expected such an outcome, he said he cannot help but feel his "anger welling up" over the decision. Erito Takigawa, deputy director of the nuclear power department of Shikoku Electric, told reporters that the utility sees that the court has acknowledged the utility's arguments and vows to take all possible safety measures for the plant.